Hessisches Staatstheater Wiesbaden, Wiesbaden, Germany. Saturday, April 29th, 2017. 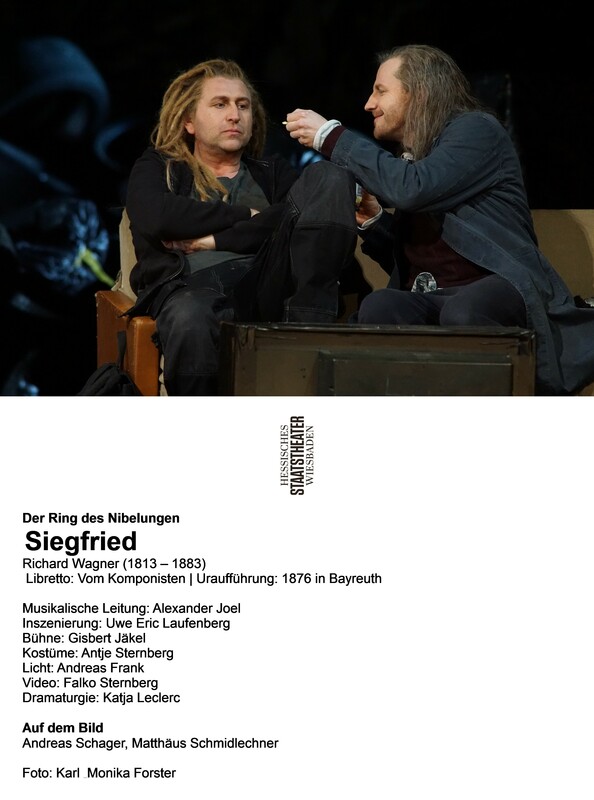 For any theatre, the Ring is the ultimate challenge and for this year’s International May Festival, the Staatstheater Wiesbaden brought together today’s pre-eminent interpreters of the roles of Siegfried and Brünnhilde, Andreas Schager and Evelyn Herlitzius. I was due to attend the full cycle but, due to other commitments, was unable to see the Rheingold and Walküre. 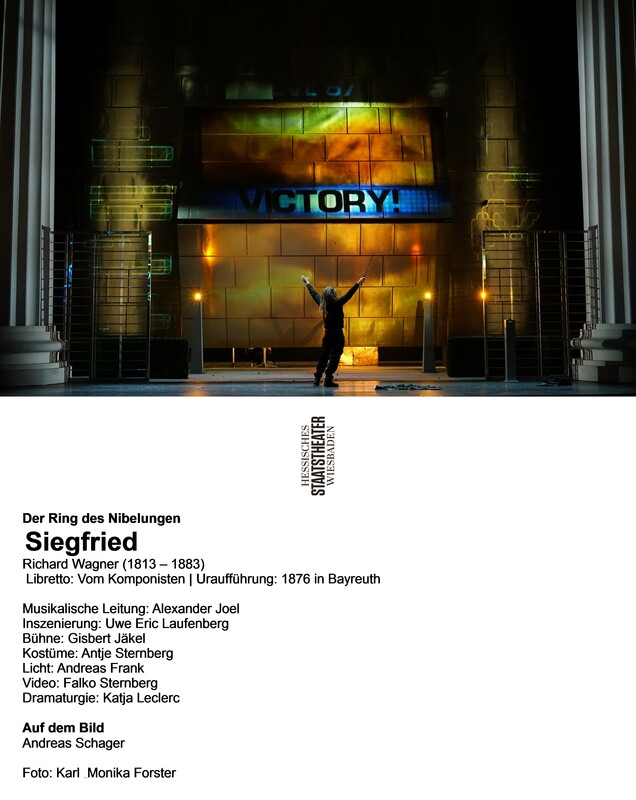 Any discussion of Uwe Eric Laufenberg’s staging is at something of a disadvantage having missed the two earlier chapters. 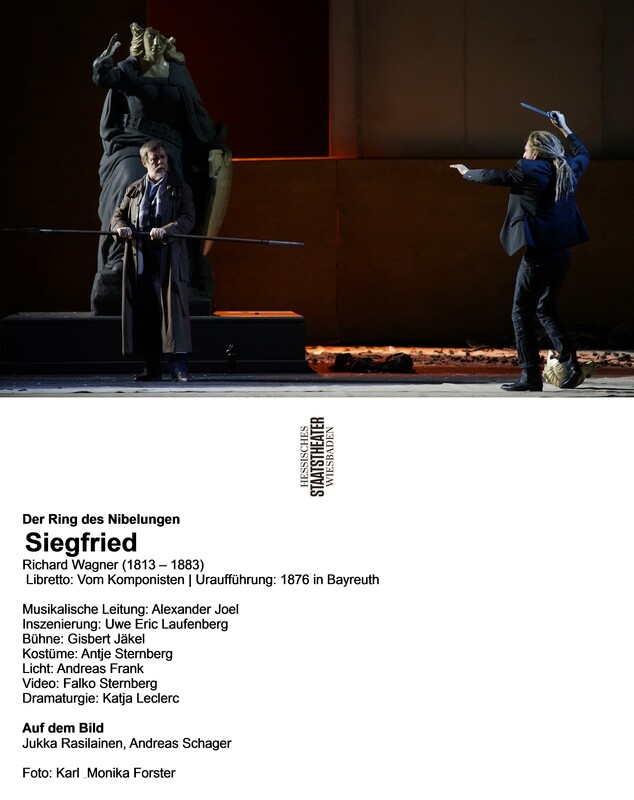 On the evidence of tonight’s Siegfried there were some intriguing hints and questions raised about what might have happened in the earlier instalments. For instance, after Siegfried kills Fafner he is congratulated and hailed by anonymous people in suits, with two further gentlemen in suits and sunglasses who subsequently follow him around. This is especially tantalizing because as the Wanderer answers Mime’s questions, we see video of images of Trump and Putin projected onto a screen that takes up half of the proscenium. Is Laufenberg hinting that moneyed elites are those who keep the world going? 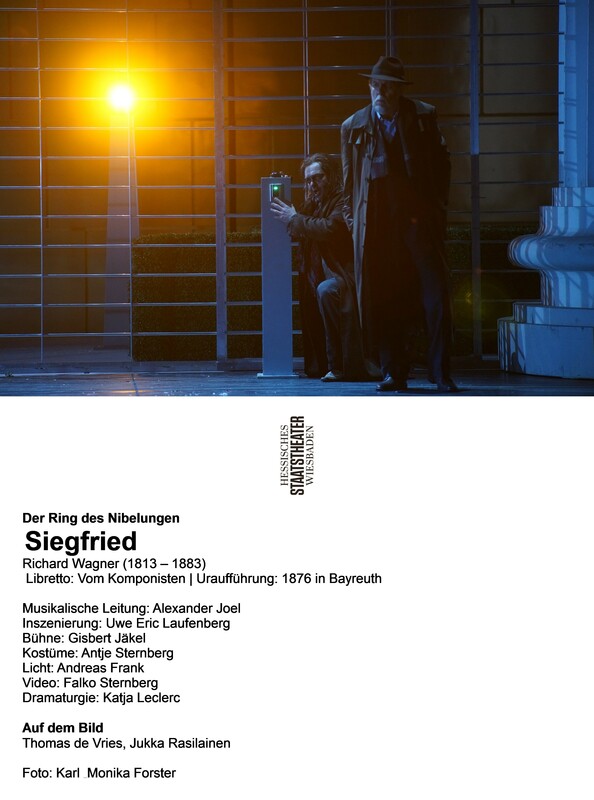 Indeed the use of video (Falko Sternberg) was for me a simultaneously insightful and frustrating aspect of the staging. There seem to be two ways of using video on the operatic stage – one that over-dominates the characters (such as Kasper Holten’s London Royal Opera Don Giovanni) or another that genuinely enhances the sets and atmosphere (Philipp Himmelmann’s Baden Baden Mefistofele for instance). In Act 2, the images projected of a living forest really brought that scene to life. Likewise, Fafner, a dragon projected on the back wall, gradually transformed into a video game that Siegfried won. I thought it an ingenious way of resolving the issue of portraying a dragon on stage, especially as he is revealed to be a man hiding behind a desk. 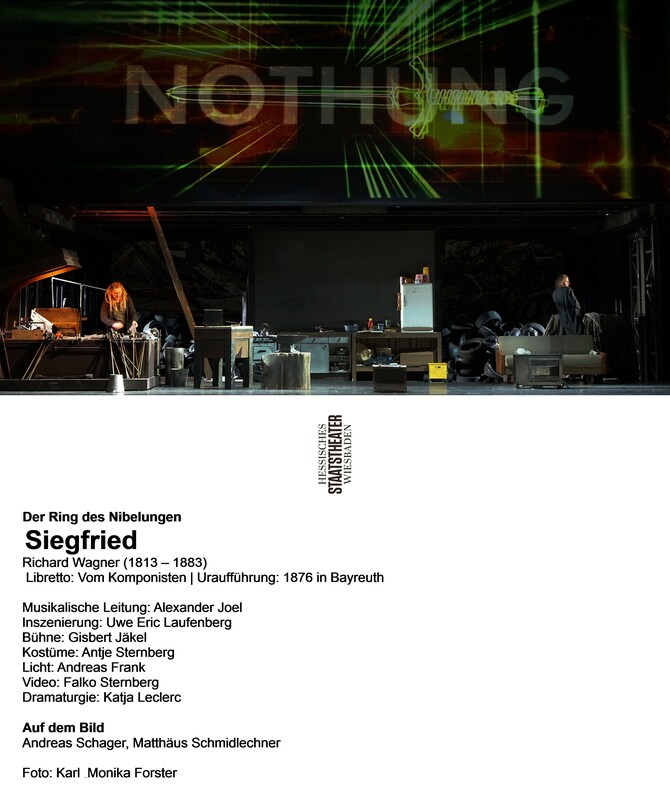 Yet in Act 1, the video was less successful, the images distracting from the principals and highlighting the fact that personenregie was either rudimentary – with characters who barely looked at each other – or clichéd, as Brünnhilde and Siegfried walked to the front for their big finish. On the whole I felt it worked, due to the strength of individual performances, but also because the text was so clear throughout from every single principal, rendering the German surtitles superfluous – though they did highlight a few occasional textual changes made by some characters as the evening went along. 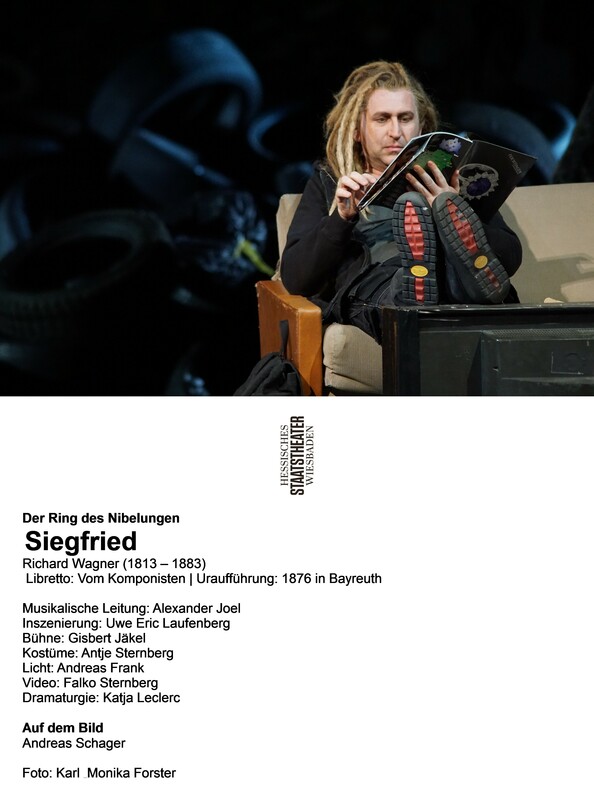 Another interesting aspect of Laufenberg’s staging was his portrayal of Siegfried as a technologically precocious teenager. He uses his laptop to forge the sword; later, he uses his tablet to hack into and open Fafner’s cave. The sound of his horn was produced by using said tablet. This really encapsulated Siegfried’s youth and the sheer stage energy produced by Schager would be enough to power an entire city. It seems that every time I write about Schager I describe him as a phenomenon. What’s most remarkable about him is his sheer stamina. 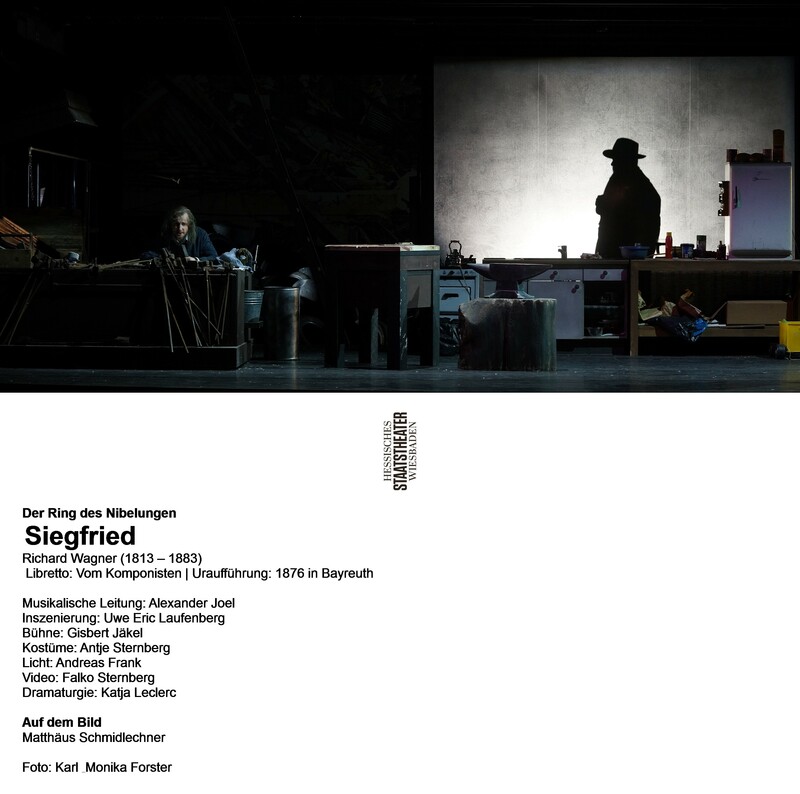 He has been alternating this Siegfried run with the Berlin Parsifal I saw earlier this month – and he even jumped in as Siegmund here two days ago. He is to be forgiven some slight hints of tiredness, then, towards the end of tonight’s mammoth sing. Yet he also, despite this incredible strenuous repertoire, sounds even more solid of tone than on the previous occasions I have heard him – the emissions always absolutely even. He brought genuine introspection to his forest scene, singing with a beautifully-shaded mezzo forte. As he forged Nothung, the voice opened up thrillingly, finding seemingly unlimited reserves of power. These had impact precisely because he uses them sparingly. As with Schager, Herlitzius is also a true singing-actor. Even when not singing she is absolutely magnetic – the positive energy she gives off similarly lights up the stage. Her middle voice is rich and lyrical and she found a hidden vulnerability that brought all of Brünnhilde’s conflicting emotions to life. Her ‘ewig war ich’ was ravishingly sung. Then, just like Schager, she found seemingly unlimited reserves of power as the duet built up to its big finish. Yes, the closing C was not quite à point but once again, Herlitzius made me believe that for those twenty or so minutes, she really was Brünnhilde and she was the only person in the world who could sing the role. Truly a great artist. The remainder of the cast also contributed to the overall high musical level of the evening. Matthäus Schmidlechner’s Mime was sung in a well-placed tenor that had steel at the top. Jukka Rasilainen ideally incarnated the Wanderer with a world-weary bass-baritone that used its unique vocal colour to bring home his character’s straddling of the past and visions of the future. Thomas de Vries was a very impressive Alberich with a voice of good resonance and rounded tone. The top sounded slightly disconnected but he’s a singer I would gladly hear again (and indeed will do in Monday’s Götterdämmerung). Park Youngdoo’s Fafner sounded quite mighty as the amplified dragon but sounded curiously smaller when unamplified. The resonance seems good but the voice doesn’t seem to carry. Stella An sang the Waldvogel with an attractive fast vibrato and bright tone, but was somewhat cavalier in pitching. Bernadett Fodor’s Erda was sung in a mahogany mezzo with tasteful chesty incursions. The orchestra, which was plagued by serious intonation issues in last month’s Onegin, was on much better form tonight. Yes, occasionally the string intonation was a bit raw and the horns were somewhat accident-prone, but the quality of playing was certainly on a par to what Londoners routinely hear on Bow Street. The string section was smaller than one usually hears – I counted ten first violins and 5 basses – and this did mean that it perhaps lacked the ultimate deep pile carpet refulgence of sound. Alexander Joel’s conducting felt ideally paced – the evening sped by and didn’t feel a minute too long and maintained dramatic impetus throughout. Yet he also knew when to pull back and revel in the beauty of the score. Tonight definitely raised expectations for Monday’s Götterdämmerung. It was satisfyingly sung, off the text, thereby making the drama vital and alive. It was fluently conducted and respectably played on the whole. If the production felt that perhaps it had too many ideas and lacked genuine interaction between the characters, it did raise an intriguing question of what a twenty-first hero should be. In this case for Laufenberg, it seems to be someone who can master technology and use it to prevail rather than physical prowess. It raises an interesting thesis and I certainly look forward to seeing how he takes it forward in the next chapter.